Our process integrates wealth management with risk and debt management, income and tax planning and philanthropy. 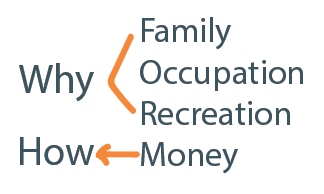 We take all the pieces of your unique financial puzzle and put them in place. The Essential FORMula™ is designed to constantly adjust and monitor your critical life and financial events to keep your plan on track. Our Proprietary Process is supported by 7 Essential Pillars: Wealth Management, Risk Management, Tax Management, Estate Management, Philanthropic Planning, Cash Management and Value Added Services. To understand our approach, we must first begin with a brief introduction to Essentialism. Essentialism is the disciplined pursuit of less, but better. An Essentialist applies a highly selective criteria to decision making, and is constantly evaluating and eliminating the non-essentials to make space to focus on what truly matters. This approach is the core of our practice. It allows us to focus together on investing in what truly matters, for what truly matters, while continually eliminating the noise of the non-essentials. 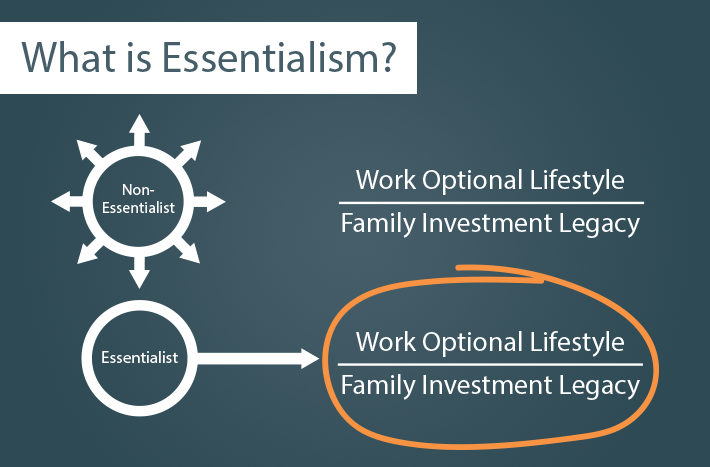 The path of an Essentialist provides a blueprint with defined steps to take to achieve a Work Optional Lifestyle and secure a Family Investment Legacy. Our process integrates with our clients' personal and financial aspirations to distinguish the vital few from the trivial many. "At Barko Financial, we believe that your financial well-being demands attention to detail; objective personal solutions; and engagement with the world around us." 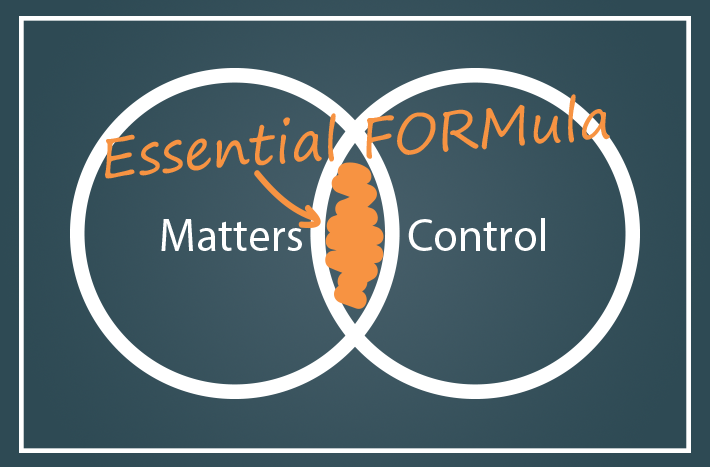 Our Essential FORMula allows us to focus on two essential details: What MATTERS and what we can CONTROL. Family legacy, Occupational pursuits, and Recreational aspirations are the WHY in our Philosophy and direct each decision we make. The Money? Well, that's the HOW, and that's where we come in. We have a process to filter the noise and focus on what's ESSENTIAL, to help you face the future with anticipation rather than apprehension. There is so much that goes on in the world, the economy and the financial markets that is out of our control, and to be candid, we don't spend a lot of time worrying about those things. Those "winds" are always blowing and always changing, but we believe that it's not the wind we should focus on, it's the set of the sail. Our PHILOSOPHY at a high level is anchored in Stewardship (not salesmanship) and revolves around FORM. We believe that while each of our clients Essentials are aligned with FORM, there are no cookie cutter solutions. 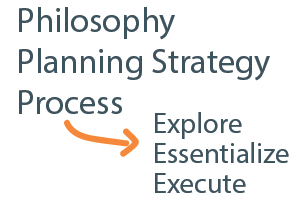 We employ a four fold, panoramic PLANNING strategy that is assembled through three distinct phases - Explore, Essentialize (or edit), and Execute. 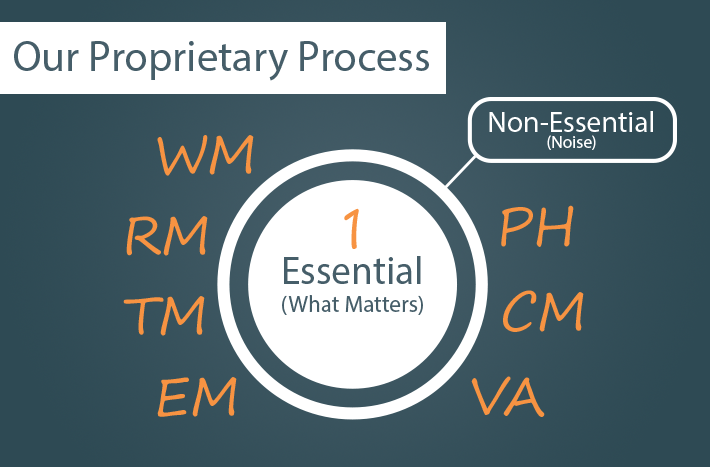 Lastly, its our proprietary process - the Essential FORMula - that puts all of this together, never losing sight of what MATTERS and what we can CONTROL. "Our Process, the Essential FORMula™, is set to sync with life as it unfolds and as your needs evolve."